It’s going to be a cool and breezy 72 degrees in NYC today after weeks of hot and humid weather. So learning that this morning, I threw on a bright sundress and grabbed a cardigan as I sprinted out the door. I made a data-informed decision even if I wasn’t totally conscious of it. That’s how data works. It’s how it should work. Data is everywhere. We live in a world of information. So why should we only see it in the form of charts, graphs, reports, and dashboards? We shouldn’t. That’s why we built Heads Up Display for Chartbeat Publishing: to give editorial teams an incredibly intuitive and efficient way to see their site’s data – right on their site. This idea of integrating data directly into the editorial workflow has always been the goal of Chartbeat Publishing. We want to give you a sense of what’s happening on your site, alert you when something unusual is occurring, and then provide you with the information to take action. Rinse and repeat. The dashboard does this brilliantly and with incredible depth (or at least we hope and hear that’s the case!) – but it’s a destination you need to go to outside of your normal routine, an extra step for you editors. Heads Up Display comes to you. It takes literally one click to activate, and sits in your browser, bringing you immediate signals about the health of your page. It provides you with a unique set of data designed to help you optimize your page – homepage, section-front or article. Total number of concurrents for the page: Clicking the concurrent number brings you to the dashboard for a deeper look at your audience and their behaviors. Traffic sources: Opens up to give you further details on your referrers, including a new feature that’s only in the Heads Up Display – specific referrers through Internal sources. That’s HUGE for story pages. It lets you understand which articles within your site are driving the most traffic to a particular page. Most clicked pages: Gives you an easier navigation option – click on this one, and we immediately scroll you to the article on the page (almost like magic!). Use Heads Up Display on your homepage to show you how well your homepage is driving traffic to the stories you’ve promoted. The ranks of each story, marked by pins, provide a super-fast sense of which stories are working and which ones are at the bottom of the pack. Then add on the velocity arrows within the ranks to see how quickly the story is accelerating or decelerating. If there’s an up arrow, it means the this story is accelerating, so you should wait and see how it plays out – maybe it was recently promoted to the position. If there’s a down arrow, the pick up is starting to slow down. Click a pin to see the click rate of that story: how many clicks per minute it’s getting in real time, and you can also see how the story’s been trending over the past 30 minutes. If the trend line seems to be falling, then it might be time to swap in another story. 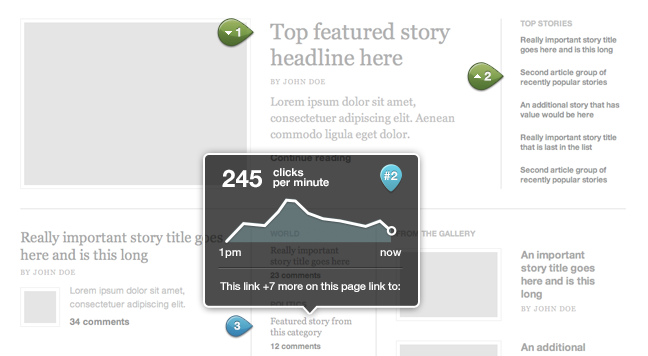 Heads Up Display on an article gives you valuable insight into how people are interacting with your story right now. Check out the Scroll Depth on the right side of your page; this is in context so you know exactly how far down the page your readers are reading. If most readers are abandoning early, then you might want to play with the content or add something more interactive like a video or an image. In this view, you’ll also see you how well related stories on that page are performing – as long as those stories are on your site. As with anything we launch, what you’re seeing today is just the beginning. There are a million things we want to add and iterate on. What makes it in first is often decided by your feedback. If you have any ideas, requests, or questions, please feel free to chat with our Chartcorps during a free online workshop, or email me directly at mona@chartbeat.com. Looking forward to hearing what you think!